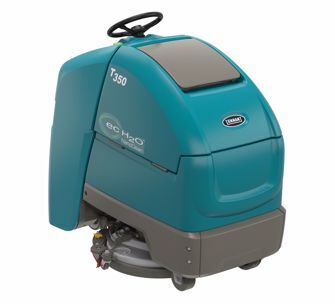 The Tennant T350 is the latest stand-on floor scrubber in the market today! Boasting a clean 30,000 square foot per hour productivity rate, for a smaller machine, the T350 packs quite the punch. Save time and money by decreasing the labor hours paid to keep your facility floors clean and safe. The T350 has a multitude of newer features that older machines are not equipped with. Such as its Insta-Click pad driver and brush ejection button for simple brush rotating, changing or pad replacement. Another unique feature is its ability to run at an extremely low decibel level as low as 59.7 dBA. This feature allows an operator to clean while business is in operation without creating excess amounts of noise pollution. The T350 stand-on scrubber is a battery-powered floor scrubber with rechargeable batteries. IRIS Asset Manager lets you monitor your machine remotely with intelligent insights about its performance. Pro-Panel LCD Touch Screen available in 28 languages offers operator training, customizable zone settings and more. Smart-Fill Automatic battery watering available. Scrub path: 20" and 24"
Battery run time: 4 hrs. Weight with batteries: 725 lbs. Weight without batteries: 490 lbs.